Images of gardens have been around as long as we humans have created images of ourselves. The Garden of Eden. The Hanging Gardens of Babylon. No wonder artists as diverse as Hieronymous Bosch, who painted the memorably grotestque “The Garden of Earthly Delights,” and Claude Monet, whose exquisite water lily paintings are currently on view at the High, have been attracted to them. Movies have cultivated gardens too. 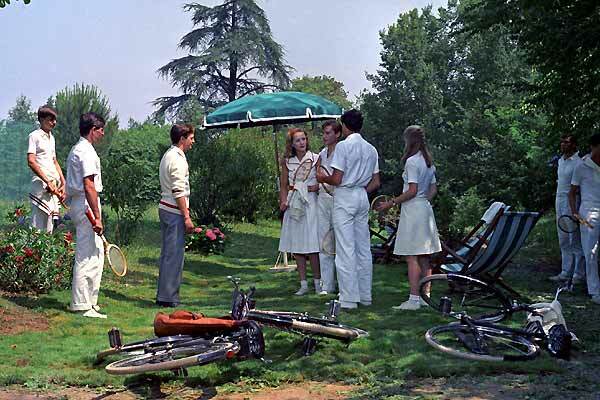 There’s the hidden play-world of The Secret Garden and the symbolic decay of The Garden of the Finzi-Continis. Marlon Brando memorably tended tomatoes in The Godfather while Ralph Fiennes buried his emotions as The Constant Gardener. In Disney’s Alice in Wonderland, the Queen of Hearts keeps her minions busy painting her roses red while Sonia Coppola’s Marie Antoinette glories in the vast gardens of Versailles. My favorite movie garden isn’t quite so glorious. It’s a small patch of dust in John Sturges’s action classic, The Great Escape. Actually, it’s less a garden than part of the POW’s elaborate escape plan. They’ve got to do something with the dirt from the three tunnels they’re digging under the German camp where they’re incarcerated. So one of them – David McCallum (of The Man From Uncle and more recently NCIS) devises a system whereby the Allied prisoners carry the tunnel dirt in the legs of their pants and mix it in with dirt raked up by the faux amateur gardeners. My favorite film gardener, hands down, is the enigmatic Chance the Gardener aka Chauncey Gardener, in Being There. Impeccably played by Peter Sellers, Chance is a kind of middle-aged man-child who’s spent his life as a recluse, dividing his time betwteen tending a garden and watching TV. When Chance/Chauncey ventures into the world, his silence and obtuse manner of speaking are mistaken for genius. He ends up the protégé of a wealthy but ailing policital power-broker (Melvyn Douglas) and his equally gullible wife (Shirely MacLain). By the end of the picture, he will be considered seriously as a candidate for President. Perhaps Kosinski understood better than he realized. He committed suicide in 1991.